K.C./Q.C. M.A. LL.B. B.C.L. Ph.D.
Harold Fox was in the course of his distinguished life a lawyer, academic, businessman and author. His memory today lives on in the many legal publications which bear his name, in the hearts of those who knew him, and through the fine work of the Harold Fox Education Fund. 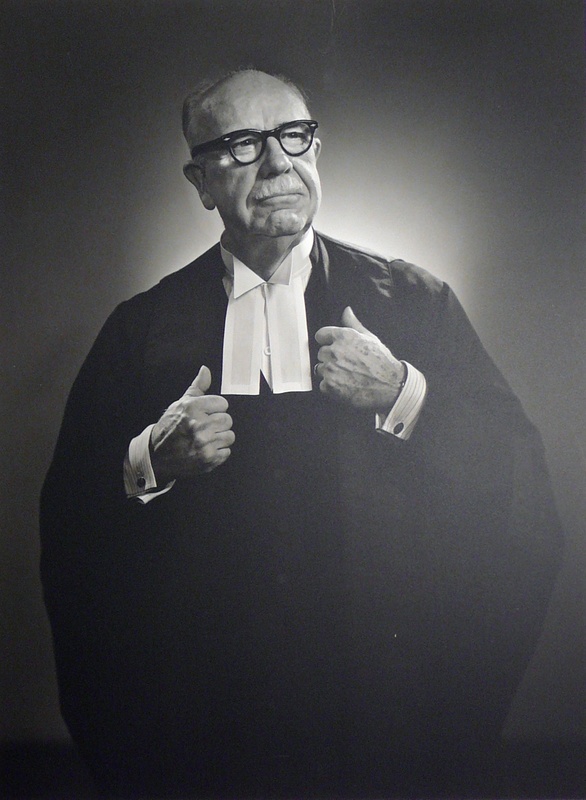 Harold was born in 1896 and was called to the Bar of Ontario in 1919, taking silk in 1937 as King’s Counsel. At his death in 1970 he was known throughout Canada and the United Kingdom as a leading authority on all matters of Intellectual Property. Harold’s legal career in Intellectual Property began with his collaboration with Fred B. Fetherstonhaugh. Mr. Fetherstonhaugh was the senior partner of Fetherstonhaugh & Co. a leader in the field of Intellectual Property in Canada in the 1920s. Fred Fetherstonhaugh was famed for selecting bright competent lawyers to work for him. Most notably Fetherstonhaugh was a mentor to one Russell Smart who ultimately bought out Fetherstonhaugh & Co. and founded what is today Smart & Biggar. So whilst Russell Smart ran the Ottawa Office Harold Fox was brought in to be the competent arm in Toronto. Harold become a partner in 1923, and created the firm of Fetherstonhaugh & Fox. Harold was considered an excellent choice as a scholarly lawyer who was equally adept at management. Harold’s rise to the forefront of his chosen field began with the publication in 1926 of ‘The Law and Practice of Letters Patent of Invention in Canada,’ a work of joint authorship with Fetherstonhaugh. By 1937 books were published in Harold’s sole name, and he began the process of establishing the definitive library of Intellectual Property Law through his books on Trademarks, Patents, Copyright and his series of Digests and Law Reports. Harold’s career saw him obtain the degrees of Ph.D, Lit.D, LL.D, LL.B and MA. and he taught at Osgoode Hall in the field of Intellectual Property. He became a Fellow of the Patent Institute in 1931 and its’ President in 1938, but it was his court work which truly made his career and his financial success enabled the Fox Fund to be created. Harold Fox’s reputation was assured following his successful litigation on behalf of the Lightning Fastener Company in the landmark case of Lightning Fastener v Colonial Fastener  Ex.C.R. 89  S.C.R. 363  51 R.P.C. 349  Ex. C.R. 1  S.C.R. 36. The case concerned the ‘Zipper’ patents of Dr. Sundback and went through the Canadian Courts to the Privy Council on both validity & infringement and then damages. The Company were however so pressed for funds in the economic climate of the 1930s that they paid Harold in shares and ultimately invited him to become the managing director. Harold managed the company throughout the Second World War a time which saw the company’s profitability significantly increase. By 1949 however, Harold was bored in his role and used a significant proportion of his time to write books. So when his old adversary in the ‘Fastener’ cases, Senator Hayden McCarthy, offered him a position of Counsel to McCarthy & McCarthy he accepted with pleasure. The years between 1949 and 1969 saw Harold’s practice grow significantly and he was Counsel on many of the notable IP cases of the day. However, when in the late 1960s McCarthy & McCarthy restructured and moved to the Toronto Dominion Centre, Harold broke away from McCarthy’s with a small group of lawyers to form what is today known as Sim, Hughes, Ashton & McKay. Harold Fox was a good deal more interesting though than a simple lawyer. His crossing of the Atlantic to appear in the Privy Council gave him a life long love of England, and his home in St. Catherine’s, which he called Foxcroft, was heavily influenced by that love. In his later years he would spend the Canadian winter on the Isle of Wight, and kept a close association with the Honourable Society of the Middle Temple where he was made an Honorary Bencher. His association with the City of London in the post war years led to him becoming a ‘Freeman of the City’ on October 18th 1956, and a member of the ‘Worshipful Company of Stationer’s and Newspaper Makers,’ on October 7th 1958. An apt Company to join given its long association with the control of Copyright. Harold’s last years were plagued with ill health. His eye sight grew worse and his neck was so stiff he was unable to turn it. Yet none of these ailments reduced his zest for life, though some who saw him drive his enormous Cadillac at considerable speed between St. Catherine’s and Toronto wished it would. When Harold died in 1969 he left his wife of many years but no children. Following the death of his wife in 1984, much of his estate was donated to the Fox Fund, an organization which has helped many young lawyers in the last 20 years, and is responsible for the wonderful annual exchange of lawyers between England & Canada, to which this author is forever indebted. It is hoped this brief account might give those lawyers who partake in the Fox Fund's activities in the future some idea of the man who made it all possible, and ensure his memory lives on. This article was written by James Tumbridge, Barrister of the Honourable Societies of Lincoln’s Inn & The Middle Temple, February 2004. The author would like to acknowledge the great help and assistance of Roger Hughes QC, whose personal memories of Harold Fox made the research of this article such a pleasure.